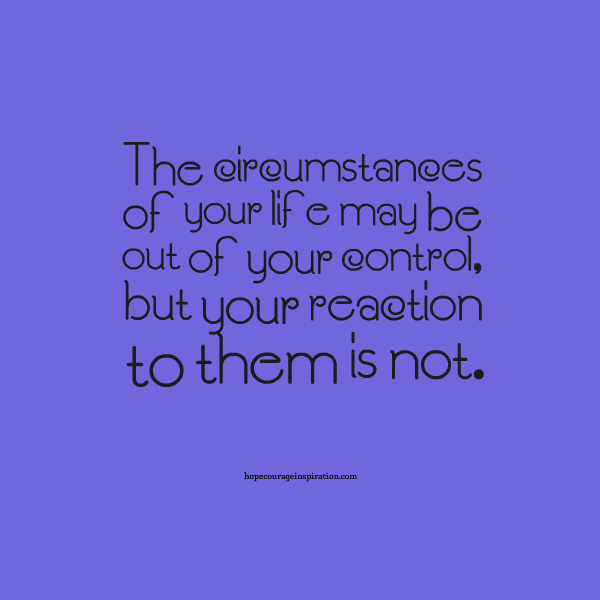 The circumstances of your life may be out of your control, but your reaction to them is not. The path you walk may be out of your control to a certain extent, but how you act and react to what happens is not. At times, it may seem as if there are few things in life you can control. While that may be true, you *do* have control of three crucial dynamics: your mindset, your actions and your reactions to what occurs in your life. The world isn’t short on challenge and adversity, and you aren’t short on ability and determination to overcome the obstacles in your path. You simply must commit to acting purposefully and forming your mindset intentionally. The work you do to empower your mindset and frame your day have everything to do with how you will react to difficulty in life. The battle is won behind the scenes and often before it’s begun. Take the time each morning to intentionally prepare yourself for the road ahead. When life comes at you fast, you’ll be thankful you did.